Read this study to learn how IT and line-of-business decision makers can advance along the five maturity stages to maximize the benefit from appropriately securing their print environment. An enterprise’s print security should be handled with the same care and due diligence as any other IT infrastructure and should comply with the organization’s overall information security policy. 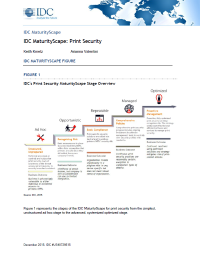 The IDC Print Security MaturityScape framework identifies the stages, critical measures, business outcomes, and actions required for organizations to effectively develop an effective print security policy.